A 3½ mile walk from Blackfriars Station looking at aspects of law and order in the City. 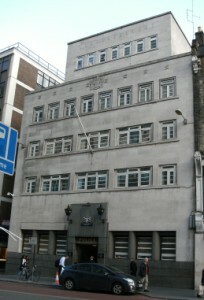 It finishes at the City of London Police Museum at Wood Street (see below). There is some overlap with the Crime & Punishment (North) walk. Exit station via subway (exit 8) and go north along New Bridge Street. 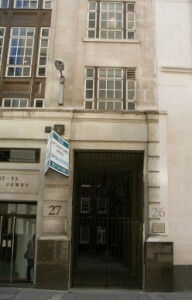 Bridewell was on the west side between Tudor Street and Bride Lane. This was built as a palace for Henry VIII but his son Edward VI gave it to the City for use as a workhouse and prison for petty offenders. The name was adopted by other similar institutions. Until the 1730s this and the Fleet Prison would have been on the banks of the Fleet River. 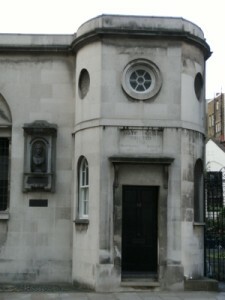 The present building at No.14, which dates from 1802, has a plaque and a keystone above the gateway depicting Edward VI. Between 1930 and 1932 traffic lights, operated manually by the police, were installed here. The Fleet Prison stood between Old Sea Coal Lane & Old Fleet Lane. This was the first purpose-built prison and operated from soon after the Norman Conquest until Victorian times. Go through Fleet Place to the right then left along Limeburner Lane into Old Bailey. 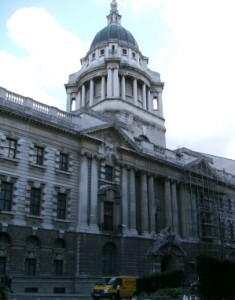 The Central Criminal Court replaced the notorious Newgate Prison in 1902. Stones from the demolished prison were used in its façade and doors and other fitments are on display in the Museum of London. The public galleries of the courts are open 10-1 & 2-5 Monday  Friday (entry restrictions). [pix] Two policemen were killed in the IRA bombings here in March 1973. The City is now divided into two police divisions with stations at Snow Hill and Bishopsgate (seen later). The premises of c1875 were rebuilt in 1925-6 to the designs of Sydney Perks. This was a place of execution. 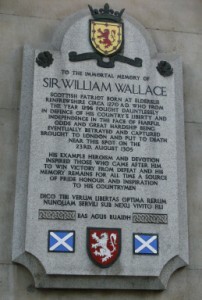 There are monuments with themed ironwork to William Wallace (Scottish Patriot) [pix] & the protestant martyrs of Mary I reign [pix] on the walls of St. Bartholomews Hospital. Leave via Little Britain and bear right along King Edward Street. Left through the former churchyard. There is a Police Post here, one of only a few remaining in the City. Fifty of these were installed in 1907 and allowed officers on patrol to keep in touch with their home station before personal radios. When a call was made from the station the orange light would flash and the bell would ring to attract attention. The public could also use the telephone in emergencies. The cast iron post would have had a Bakelite telephone inside and a first aid kit was kept in the upper locked compartment. 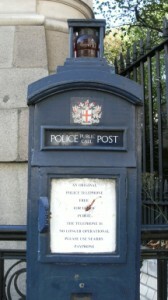 City of London boxes had the City coat of arms and were originally light blue, subsequently painted in the Metropolitan Police dark blue. They were in use until 1988. 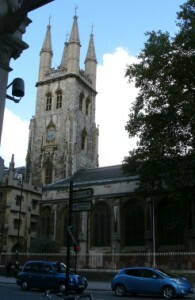 [pix] This was also the site of Aldersgate, one of the gateways in the City wall (plaque opposite). This was guarded day and night to protect the City and closed at curfew. Most gates, some of which had served as prisons, were demolished in 1760. Head towards the Museum of London roundabout. Cross then go right along London Wall. Left at Wood Street, right at Fore Street then left into Moor Lane. In 1993 The Corporation of London implemented a traffic management scheme which reduced the number of entry and exit points around the Square Mile. This also facilitates security measures. Almost one third of the City was destroyed by bombing on the night of 29th December 1940 including much of the area redeveloped as the Barbican. Moor Lane Police Station was damaged beyond repair and 12 policemen were injured. Right along Ropemaker Street then right at Moorgate. In 1975 City police were first on the scene of the Moorgate train crash where 43 people were killed and many more seriously injured. Among the casualties was 19-year old Margaret Liles who had joined the City police only the week before. She was trapped in the first carriage and was the last one to be brought out after a 12 hour ordeal. Go through Finsbury Circus opposite then left at Blomfield Street and right along Liverpool Street. There is a restored police post outside the station. Return along Bishopsgate and go left through Devonshire Row and Devonshire Square. 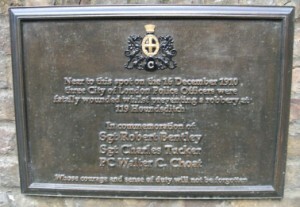 On a low wall at the junction of Cutler Street is a memorial plaque. [pix] In December 1910 three City police officers were killed and two seriously injured trying to arrest a gang of criminals who were attempting to rob a jewellers in nearby Houndsditch. 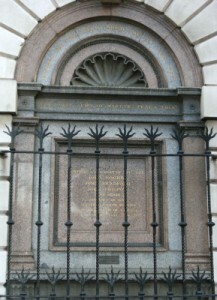 Two of the gang lost their lives in the famous Siege of Sidney Street which followed. There is a police post outside the church of St Botolph. Many commendations were awarded to City police for their response to the London bombings on 7 July 2005 which killed seven people at Aldgate. 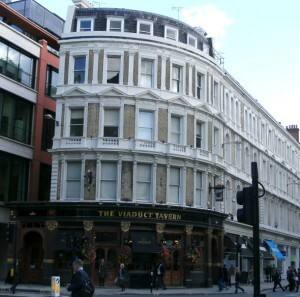 Return along Duke's Place then walk through St James's Passage and Mitre Square to the left. 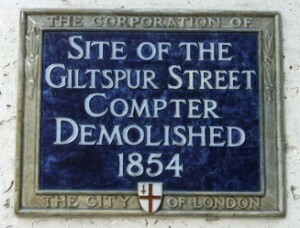 The only one of Jack the Ripper's victims within the Square Mile was found here in September 1888. Catherine Eddowes had been held at Bishopsgate police station for drunkeness the day she was killed. On 10 April 1992 the Baltic Exchange at number 30 was extensively damaged by an IRA bomb which killed three people. It was replaced with 'The Gherkin'. 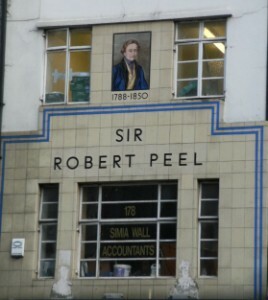 Opposite this building walk through Undershaft and Great St Helens (alongside the church). IRA bombs damaged buildings in this area in 1992 and 1993. 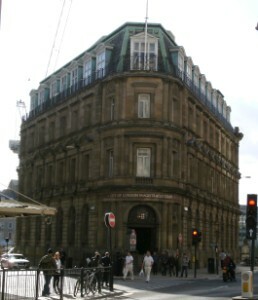 The first automatic traffic lights in Europe were installed at the junction with Cornhill. Continue to Bank junction and cross to the Mansion House. Left at Gresham Street and right into Basinghall Street. Walk through into Guildhall Yard to the left. 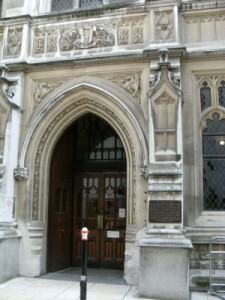 The Mayor's Court, which combined with the City of London Court in 1921, is the oldest local civil court in England. 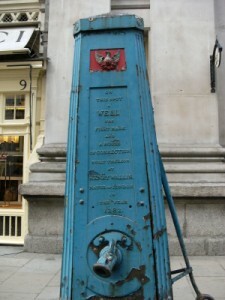 It has sat for over 700 years, virtually without a break, within the precincts of the Guildhall. Today the Court sits daily in its present building which was erected in 1888. In 1971 it became part of the general County Court system of England and Wales. [pix] The City Police HQ was in Guildhall from its formation in 1839 until 1842. The Wood Street police premises were built in 1966 by McMorran & Whitby on the site of a Roman fortress. The specialist crime and operational support departments operate from this building which also has stables for police horses. Bomb Damage to Moor Lane (35535) & Snow Hill (35590) police stations. Type number into Collage search page to view. A City of London Police history (to 1989) [click here] Tip: use file - print preview to avoid reading this document with the awful blue background!